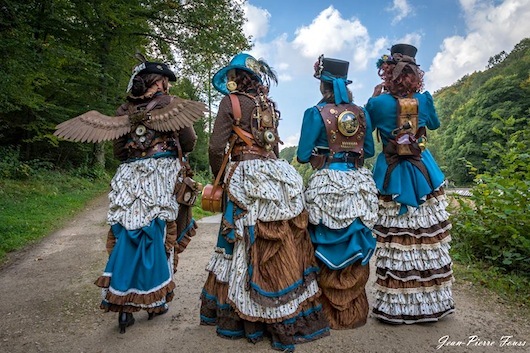 Anyone who has attended a Steampunk convention or festival knows that nothing garners attention quite like a good group costume. When done wrong, it's forgettable at worst, when done right, it's a showstopper. 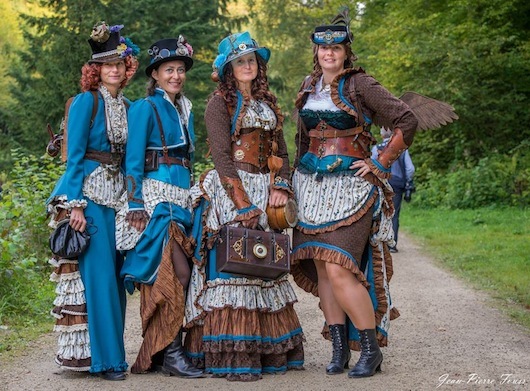 Today we bring you an example of a group costume done exceptionally well--in fact, it's not just one group costume but three, worn over three days of events by a group of four awesome ladies from Liechtenstein. 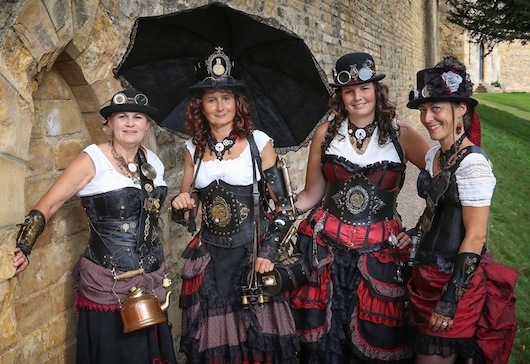 Some know them as the Liechtenstein Ladies, or the Liecktensteams, and if you attended this year's Asylum Steampunk Festival in England or 1900 Anno in Luxembourg, then you may have been lucky enough to see their costumes in person. We were so impressed by the costumes individually-- each one has thoughtful accessories and beautiful styling and ornamentation that makes it unique. But they're even more impressive as a group because they fit together cohesively without being identical. It's like a really cool fashion designer decided to put out a Steampunk collection, and here come the models straight off the runway. We reached out to Anna, one of the Liechtenstein Ladies, who told us that the rest of the group is comprised of her daughter, and a group of friends Anna made in a local Carnaval club. They also make costumes every year for Carnaval (don't even get us started on how amazing those costumes are). Anna was kind enough to answer our questions about how her group plans, designs, and creates their costumes, as well as to offer some advice to readers interested in putting together a group costume of their own. Did you make all 3 sets of costumes yourselves? "Yes, we do our outfits all by ourselves from the sewing to leatherwork and all the tinkering. It's a hobby and fun for us. We didn't make all three outfits for Asylum 2017. We did only one each year (I did some more without the group). 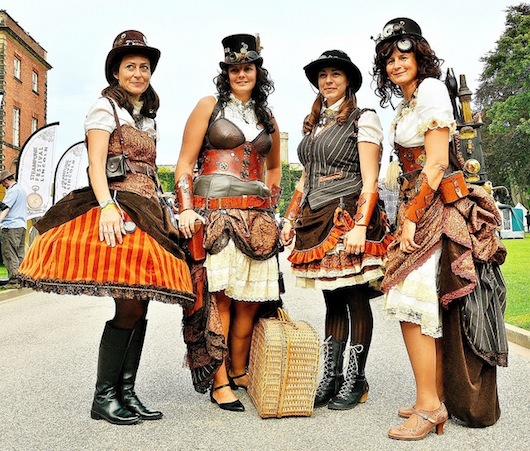 Asylum 2015 was our first real Steampunk event and the brown dresses were the first Steampunk outfits we made. For 2016 we made the red/black one, and this year the one with the bright floral fabric." Do you design and sew your own outfits, or do you plan everything as a group? How long does it take? "Each sewed her own outfit, and each did her own design. The outfits match always together because the materials are the same. We first speak about ideas or colours, I suggested brown for example, and all the others liked the idea. I ordered some different brown sample materials and we decided together which of them we would use. Then I ordered the same amount of material for each of us. But as every lady has her own ideas, we do not use it in the same way and everybody is free to add lace and ornamentation. In addition, we love to use leather, brass and all kinds of flea market stuff, to make our accessories. Everyone is totally free to implement their own ideas. I can hardly say how long it takes to make an outfit because we work on them when we get time and inspiration. Most of us start early, but in the end we have to hurry up because time went too fast." Do you start working on the costumes months before the event? "Yes, we start a few months before. We already have new ideas for next year and we've started searching flea markets for material. But we do not start sewing before spring because we are all in the same carnaval club and first we have to make our dress for the next carnaval season. By spring at the latest, I order the materials for the new steampunk outfits, then we have time until August. But we all have family and other hobbies as well. 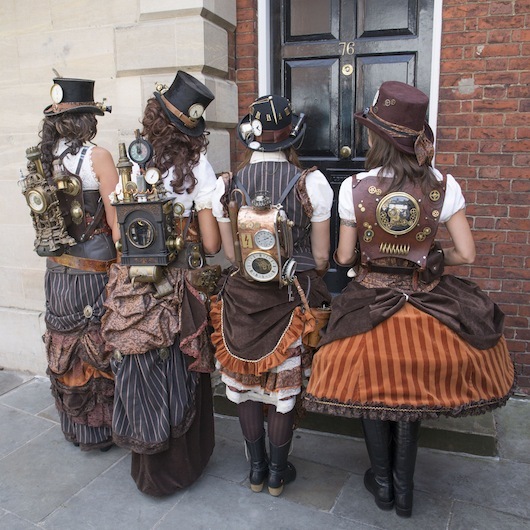 I also do other steampunk projects (lamps and other gadgets) and I did a few other steampunk outfits without the group. Therefore time is always rare." Did you have any problems attending an event as a group? Do you have any advice for people who are thinking of attending in a group costume? "If you fancy to attend as a group, just do it! There are no special problems. If the group is too big it gets difficult to stay together at a big event, and you have to wait often because there is always someone talking to someone. But it's fun!" Thanks for the advice, Anna! 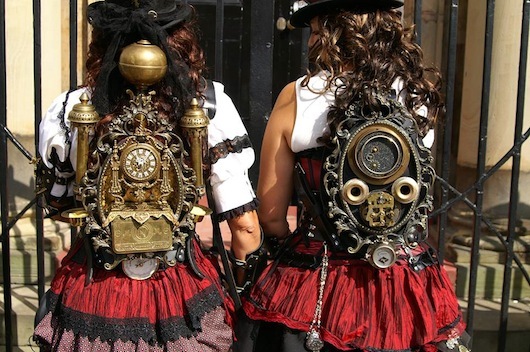 We hope this inspires more group costumes at future Steampunk events.